SUNSET PARK – The air abounds with the noise of tiny firecrackers popping under foot as the crowd shuffles along. Glitter and confetti transform the pavement into a patchwork of pastel colors. 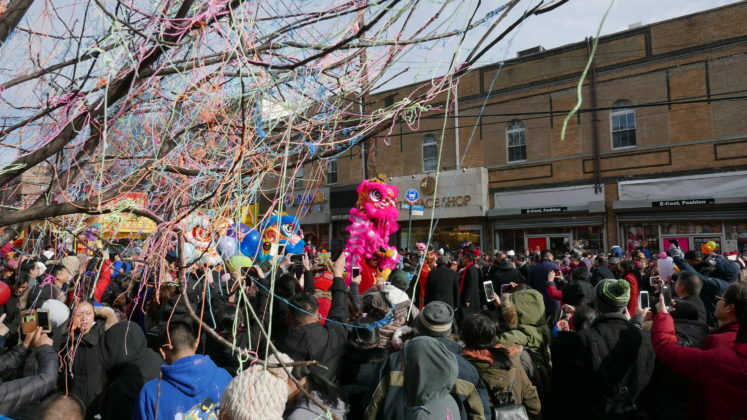 Children and adults delight in equal measure over cans of silly string, chasing one another through the street. Drums beat, dragons and lions dance. 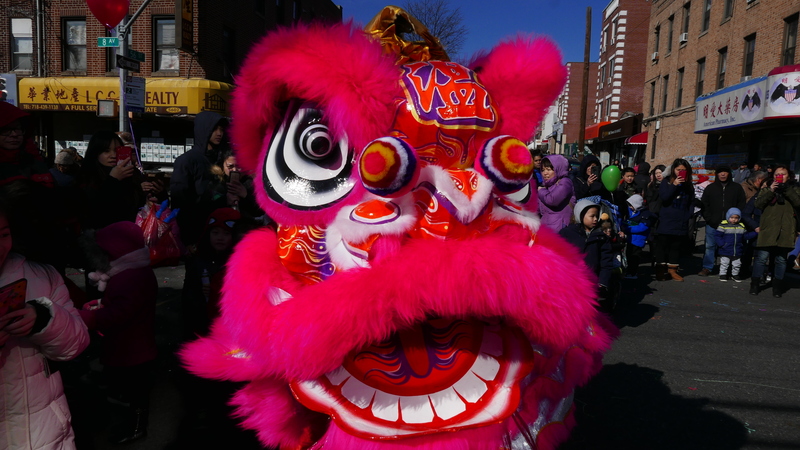 Gung hay fat choy, the Lunar New Year is here! 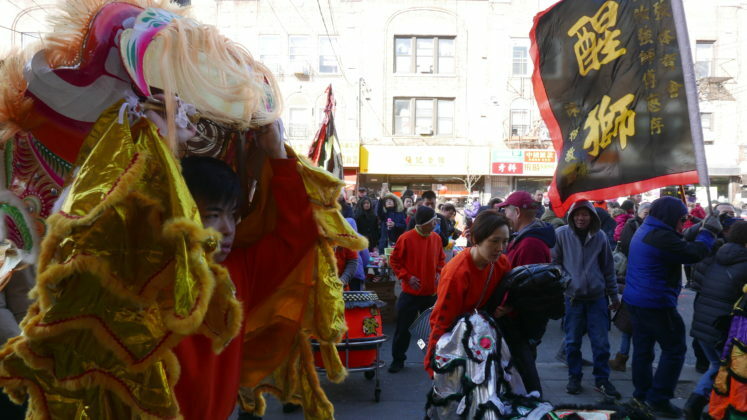 Merrymakers shrugged off Sunday’s chilly weather and came out in droves to usher in The Year of the Pig at the 32nd anniversary of the New Year parade in Sunset Park. The Chinese New Year, also called the Spring Festival or Lunar New Year, began on February 5th after the new moon. The Chinese calendar runs on a 12-year cycle with 2019 marking the Year of the Pig, an animal associated with fortune and good luck in Chinese culture. 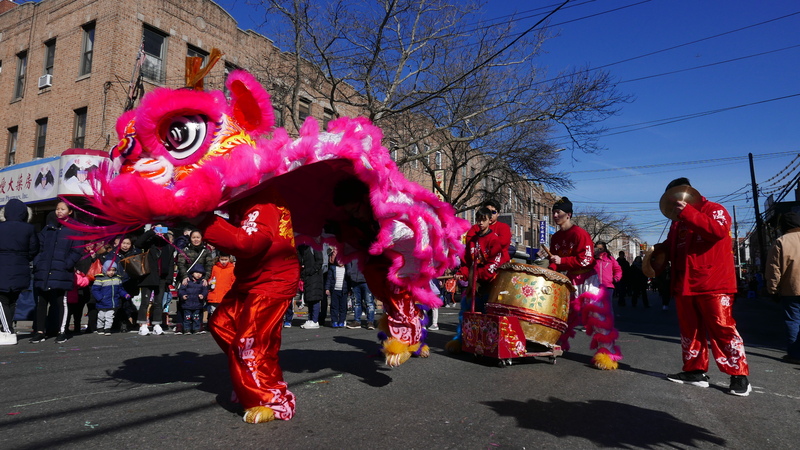 Dragons and lions are a part of New Year celebrations around the globe. 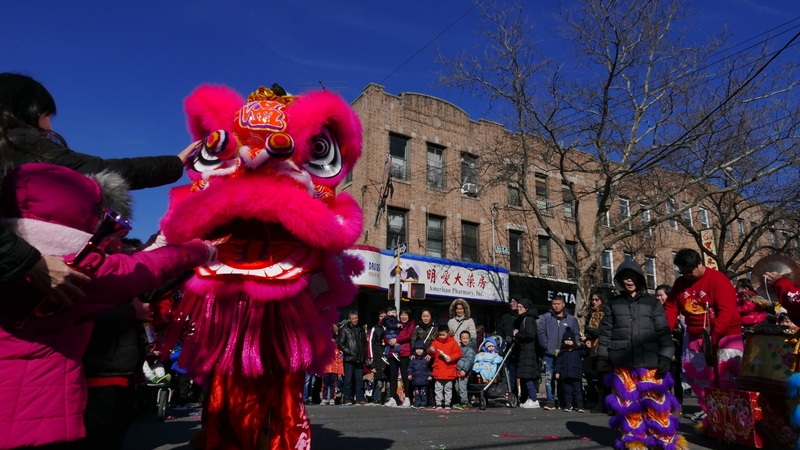 In Sunset Park, pairs of dancers in lion costumes performed in the street, pausing to accept gifts of lucky red envelopes from children. Red is a sign of good luck. Down the block a trio of lions went door to door along 8th Avenue and visited each business along their route. 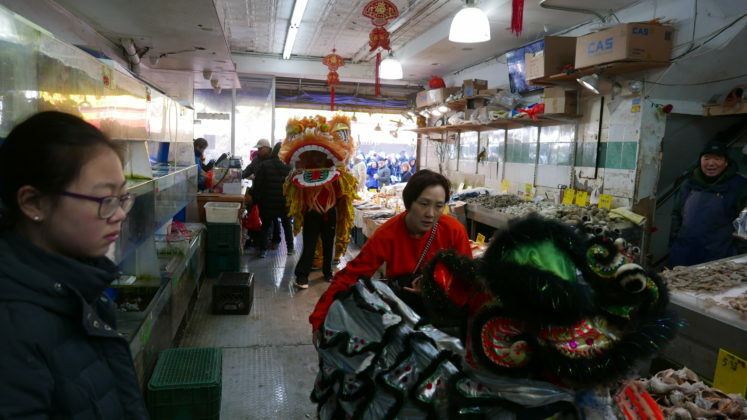 “It’s for good luck, fortune, and to bless the store for the New Year,” explained parade volunteer Victoria Wong. A tree covered in silly string along the parade route during the Lunar New Year celebration in Sunset Park on Sunday, February 10th. 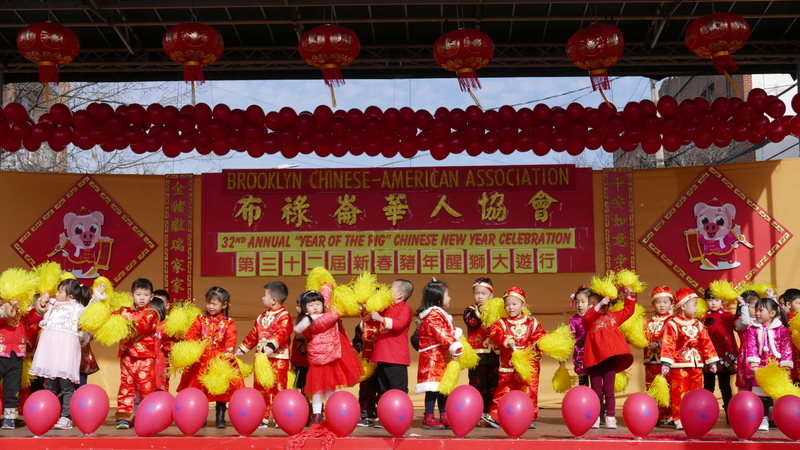 Local politicians and officials attended the festivities, including Senator Chuck Schumer, Congresswoman Yvette Clark, Congresswoman Nydia Velázquez, NYC Comptroller Scott Stringer, and Brooklyn District Attorney Eric Gonzalez. 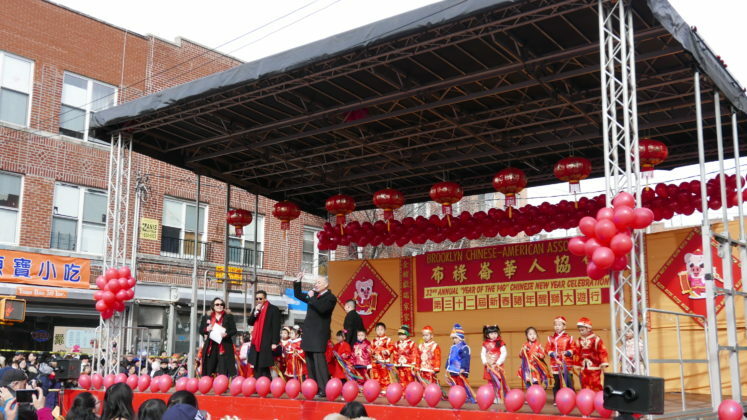 Addressing the crowd, Senator Schumer spoke of the contributions Asian Americans have made to the country. “Thank you for coming to this country and thank you for coming to New York. You are what makes America great!” he said. “I don’t care if you have been here since breakfast or since birth, this is your home,” said Council Member Justin Brannan of Brooklyn’s 43rd District. Fireworks followed the speeches and hundreds of red and gold balloons were released into the air and the parade began. The festive crowd lit sparklers and launched confetti cannons into the air along the way, covering trees, and each other with glitter and silly string. The Year of the Pig has begun! Ann is a freelance journalist based out of Bed Stuy. She currently attends the Craig Newmark Graduate School of Journalism at CUNY.